Abby moves in next to him, but she carries a heavy burden with her that will affect Owen. Jonesy: I liked it. I thought it was pretty like you said, but it’s not my favorite of the year, and it probably won’t even be in my top of the year list. I just thought it was a little too long even if it’s two hours. Javi: Apart from the very first sequence, the movie matched the original perfectly. It added some suspense to the movie if you didn’t know what the movie was about. As a standalone movie, I can’t necessarily say what this movie is; I can only compare it to the original. That’s my only basis for it, and either way I enjoyed it. I thought it did a lot of cooler things than the original. I’m not sure if I liked this movie being less ambiguous than the original because is it dumbing it down for American audience, or is it explaining a flaw that the original Swedish one had? But since the original is so loved we never thought about it. I agree the original is very well liked. The American version is more subtle because that’s just the American style of cinema, just in general. When I watch this movie, I can almost watch and think of it as a standalone movie because I only remember random scenes from the original. I’ve only seen the original once, and it was over a year ago. I do like a bit more of the subtlety in the acting in this one better. I think the kids are more way talented than the originals. I think they have better chemistry because whenever she held his hand, I felt a tingle. It’s a first love movie. It makes you think back when you’re 12 years old and of your first crush and how that felt and going out…. Whenever she gave him that kiss on the cheek, and the look of his face, he looked like he got laid. Great stuff. I agree…the American style I like a lot better. I liked that it had a clearer ending because I was too stupid to realize what was going on in the original. And then, we had the music cues. It always let us know there was gonna be danger and that something bad going to happen. A little bit initially was ok, but the cues got old. The first couple of instances it was very effective because I got tingles. I will say that the music with Ronald Reagan and religious symbolism really set the mood. What does Ronald Reagan have to do with religious symbolism? Nothing…well, when he was shown in the movie, he was never speaking about anything political, and it was all about morality and overcoming it and things like that. I found that it was weirdly tied together. It added a weird dystopian feeling even though it wasn’t meant to be. I can only equate it to movies where robots have taken over or 1984, but there’s something so weird having all this constant religious type of things with Ronald Reagan with a Big Brother sort of presence. Anyway, that’s what it felt like to me. I don’t know what Matt Reeves was trying to do necessarily, but that’s just the way I saw it. He made it have a sense of hopelessness or constant conflict. For us not being raised in the 80s, or at least not remembering, and the fact that you felt that is probably what he wanted. There are all of these fears of getting attacked, and there were all of these crises from the 70’s that were still looming over everyone, and so for comfort, people probably turned to religion in the 80’s. I’m sure the mom turned to religion because of that and that’s why she changed and the dad couldn’t deal with the change. What I liked about Abby’s character was how she put herself in danger in order to impress Owen, like the Now and Later scene, but I wonder if she did that with Caretaker #1? That in a way makes me feel bad because she probably has done this so many times that she knows how to get an emotional reaction out of people. That’s more manipulative than she was made out to be. And that actually plays on the title because the original one is “LET THE RIGHT ONE IN” because she would choose the right person to let into her world or that you have a choice. 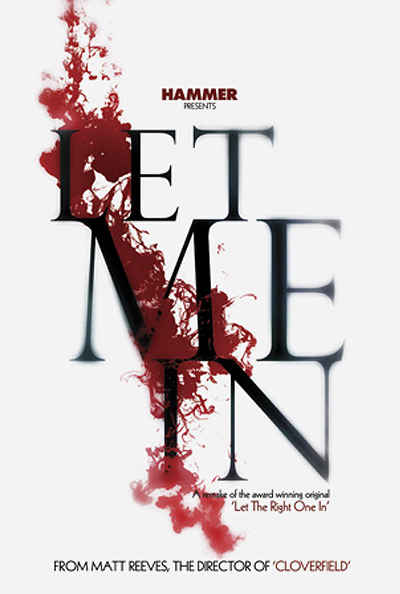 This is just “LET ME IN”, and that title seems more forceful, which goes along with what you said about Abby being manipulative. Then I wonder if it was Matt Reeves’s intention to focus on that aspect. It’s weird because it’s the same actions she did in the original, yet I didn’t get the manipulative impression. In major difference is the American version didn’t show that she was really a boy like the original did. Personally, I liked that. Well she’s a boy, that’s the whole thing, that’s explained in the book. And his origins were in the colonial times and for some reason he was castrated. Why did you like that aspect being left out? That bugs me a little that people aren’t mature enough for that. If they choose to see it that way. figure if you make it brainy, you might as well throw that in there. Conclusion: It’s a very worthy adaptation of the original Swedish LET THE RIGHT ONE IN. There are some stylistic differences that show Matt Reeves’ skills that were not apparent with CLOVERFIELD. There are elements of the story that are changed completely to varying effects, ie the opening sequence. The actors in this movie are superior to the original movie with special kudos to Chloe Grace Moretz and Kodi Smit-McPhee for showing skill far eyond their years. It is highly recommended for high concept-horror fans and anyone that isn’t afraid to get a different take on the vampire genre.